Appoint members to the Working Group, and approve the Working Group charter. Review and approve the EULRP workplan and budget on an annual basis. Oversee and approve the planning and implementation of the EULRP. Assist management in determining financial, staff, and contractor resources that are necessary and sufficient for the implementation of the EULRP. Review and approve distribution of the EULRP confidential information to third parties. Inform EULRP funders and Board on the activities and decisions of the Committee. 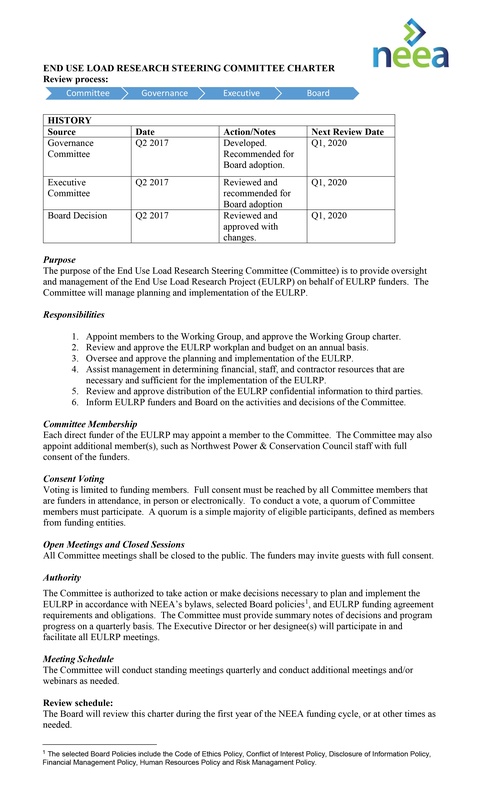 Each direct funder of the EULRP may appoint a member to the Committee. The Committee may also appoint additional member(s), such as Northwest Power & Conservation Council staff with full consent of the funders.